We all brush our teeth regularly every day but the problem is how good we are able to brush our teeth. The issue with the normal brush is that it’s hard to reach some spots of our teeth that we miss out in our regular routine, it creates the problem with your teeth in long run. if you are worried about your teeth and searching for a better alternative to the normal tooth brush, here we are with the answer. Engineered to perform, the Lebond electric toothbrush utilizes ultra high powered sonic rechargeable electric toothbrush is in a class of its own. Unlike a manual toothbrush, it uses powerful Sonic technology to clean teeth with up to 31,000 brush strokes per minute. Sweeping motions drive fluids deep into the tight spaces between your teeth and along your gum line, resulting in a cleaner, healthier mouth. 1. The product is only designed to clean your teeth, gum and tongue, please do not use it for any other purposes. 2. This product is for private effects, not for the use of dental clinics or institutions for many patients. 3. The toothbrush should only be used in door and should not be exposed to the sun. It should be kept in room temperature or dry and airy place. 4. If the charging indicator doesn’t light during the time of charge after a long term non-use, please wait patiently for 6-10 minutes, then it will go back to normal. Short press the function key after starting to shift the gear and do the same for other gears.With one button to suit different conditions of teeth and gums. Continuously pressing on the start button will start the free control mode. In that mode, you can control your time freely and it will stop whenever you stop pressing it down. 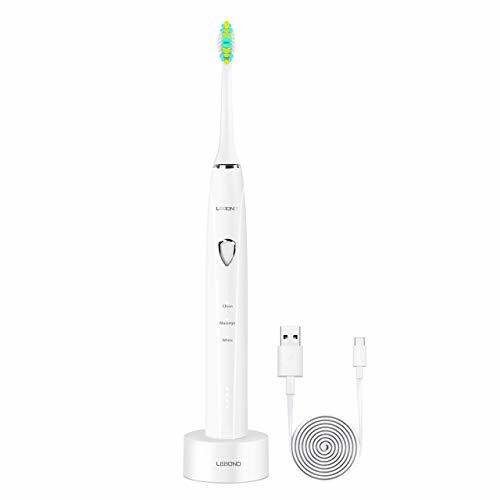 1× Charging Base【3 Brushing Modes and Free Control】 The Lebond M1 electric toothbrush customize your experience with 3 speed oral care modes: clean, massage, white. And with the free control option to suit your needs. 【Powerful High-frequency Sonic Sound Wave】Sonic toothbrush pulsates up to 31,000 brushes per minute. Removes up to 300% more plaques and stains, compared to a regular manual toothbrush. Enjoy a healthier set of teeth in 14 days and improved gum and oral health in 21 days. 【Inductive Charging & Long Battery Life】 Charged via charging dock, safe and easy, auto shut off after full charge, compatible with most power sources. 8 hours charge for minimum 30 days use, you can bring it to a travel or business trip without worry. 【High Quality and Warranty】LEBOND MY Electric Toothbrush patented sonic technology and designed and tested through three professional mode and adopated inductive charging inspections to last 10x’s longer than many others on the market. Lebond MY tooibrush enjoy 45 days money-back and 12-month worry-free warranty.